In the two World Wars, a Christmas spent in conflict meant different things to all different sorts of people. 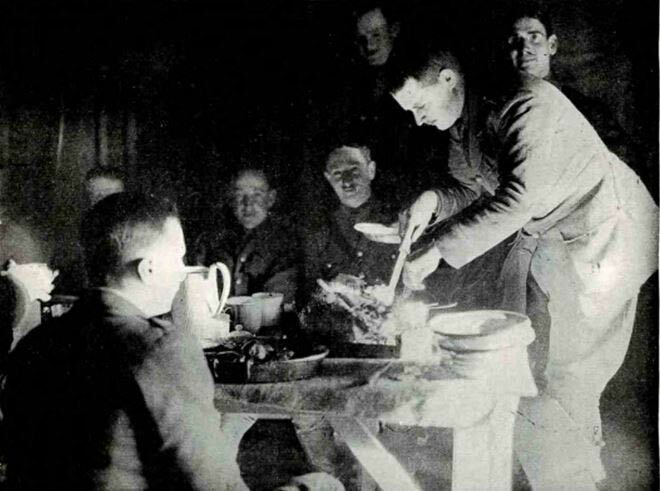 One thing was true for everyone, though; whether the season was marked in the trenches and on the Front Line, in a Prisoner of War camp far from Britain or back on the Home Front, nobody was having a ‘normal’, traditional celebration. Attacks, operations, shortages, worry and longing for loved ones far away made sure of that. 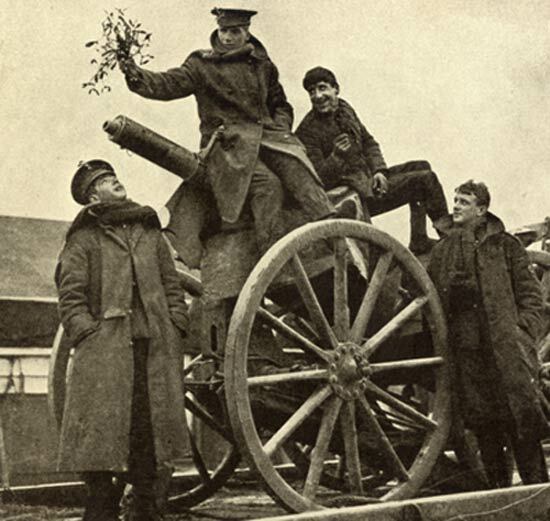 So what did a Christmas spent at war look like? Everyone has surely heard of the Christmas truce of 1914, when German and British soldiers came out of their trenches in certain areas of the Western Front to sing Carols together, exchange gifts or kick a football around, with one soldier writing to his mother, “War was absolutely forgotten. They weren’t half a bad lot, really.” However, every account of the truce agrees that this show of peace was unique and special, and certainly not a common thing (apart from anything, the authorities banned ‘fraternisation’ in the wake of these niceties). Elsewhere that same year, one German plane dropped the first bomb of the war on British soil on Christmas Eve (which thankfully did little damage), while another had to be chased away from the coast near Sheerness by our own fighters on Christmas Day proper. At sea, Sub Lieutenant Stephen King-Hall, on the HMS Southampton, organised a ‘concert’ of sort to cheer up the sailors at their action stations by hooking up his gun-control telephone to a gramophone, so that they could all listen to music. The day almost took a tragic turn when a torpedo was suddenly fired upon them by an enemy submarine, but thankfully it missed the ship. The crew of Southampton lived to fight another day, and no dreaded telegrams were sent out to ruin the holiday season for their relatives. Meanwhile, our side was launching the first combined sea and air strike, the Cuxhaven Raid, during which our seaplanes, with support from ships and submarines, pre-emptively bombed sheds housing German Zeppelins in an attempt to stop them attacking Britain. A year later, in 1915 at Kut-al-Amara in Iraq, a vicious attack was launched by the Turks on Christmas Eve as part of the Siege of Kut. As reported in ‘Twenty Years after the Battlefield of 1914-18, then and now’, a bombardment lasting several hours preceded a short, sharp burst of hand-to-hand fighting that lasted a half hour. In the afternoon the Turkish soldiers regrouped, and at 8pm their bombers and infantry launched a second, larger attack. The 103rd Mahratta Light Infantry was practically wiped out in the first few minutes of combat, and six hours of fierce fighting followed before the Turks finally retreated again in the early hours of Christmas Day. It is hard to imagine a more miserable way to welcome in what should be a day of rest and celebration. “Christmas was spent quietly. I drew a load of petrol on Xmas Eve and took my diary into the MSM to sign out; he queried my lorry only doing 5 miles per gallon until he noticed other 4 tonners doing 4mpg. They were always making petty criticisms. I got a week’s letters and some parcels. A cake from Mrs Lea and a soft woollen scarf which I sent home as being too good for war and I still have it in 1934. Previously I had a pass to go back to civilisation; the QSM, Sergeant, I and mate went to Amiens for some Christmas fare and whiskey. It was a treat to see people. I went to the shop for some celery and oranges etc. and aired my French on a very pretty girl, after I had struggled to say something she said, “What is it in English, I was a long time in Devonshire before the war.” I felt a fool and soon went out. We had a meal of 6 eggs each at the expense of the QSM. He and the sergeant went off for a long time and my mate and I went into the Cathedral where people were at Confession. The R.A.S.C. 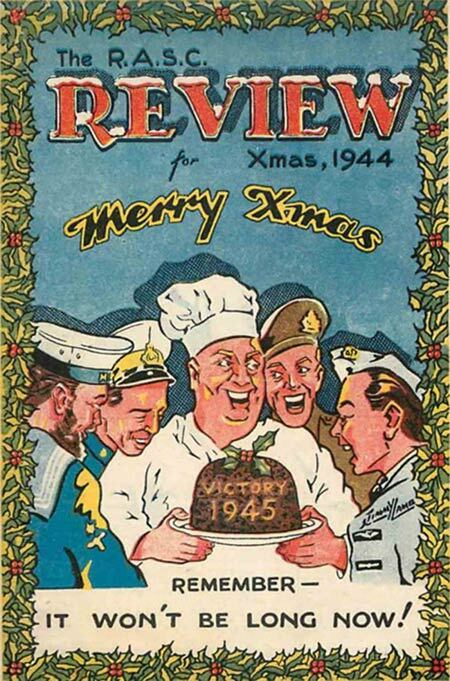 Review for Xmas 1944 in our Historic Documents archive tells a story of relative brightness and optimism as the Second World War drew to a close. Many long years had been spent at war, and 1940 had been a particularly dark time for Britain, when the country stood alone in Europe, invasion seemed imminent, and even once ‘Operation Sealion’ had faltered the German bombers remained the give the British civilians a very difficult and anxious Christmas. King George VI’s Christmas broadcast of the same year, whose transcript is also available to read in our Historic Documents Archive, is a bit more solemn, speaking as it does about families scattered around the world, soldiers held captive or lying in hospital wounded or sick, and ‘the grief of separation’ where combatants have made the ultimate sacrifice. Merry Christmas from Forces War Records!